From the first day of Student Patrol classes through graduation, Cowley College’s criminal justice students are lectured on the merits of striving to be a five percenter. A five percenter is that officer that does above and beyond the normal. They are taught to go the extra mile and to make that extra mile a part of their routine. A five percenter is the one that strives for professionalism and excellence even though it requires extra effort. There are always those students that take this to heart and display the traits of a five percenter both inside and outside of the classroom. 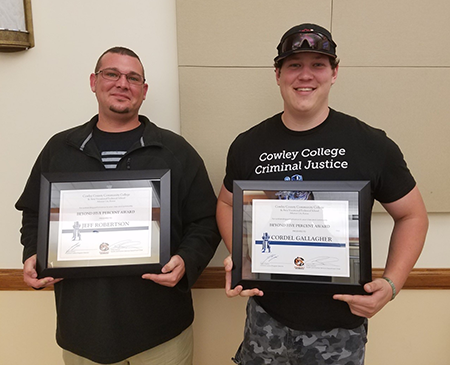 A tradition in the Criminal Justice program is to honor sophomores who have exemplified the five percenter philosophy during their time at Cowley and gone above and beyond. These students have displayed the willingness to excel not only in class but in their community and personal lives. They work hard and help others to achieve as well. The recipients of this year’s Beyond Five Percent Awards were Cordel Gallagher and Jeff Robertson. Both of these students have served as leaders for their class and displayed a willingness to serve beyond what is expected. Cordel will be finishing a second degree with Cowley over the summer and plans to transfer to Wichita State University. Robertson will finish his degree in the fall and plans to pursue a career as a law enforcement officer.